Let me take a minute here and remind you that I have nothing to do with your protocols, policies, QA reviews, or your ability to continue to receive a regular paycheck. But I want to share my thoughts on this subject. The reason for this post is that I hate adenosine. So adenosine is the choice, right? Electricity is for really sick patients and adenosine is for people who aren’t that sick. That’s comforting – a nice, easy binary decision that even an average medic can make when confronted with a narrow complex tachycardia. The problem that I have is that adenosine is not harmless. It stops the patient’s friggin heart! And it hurts! And it can make them worse. I can hear voices in my head: “But it has such a short half-life, the period of asystole and pain is pretty short. I’ve never had a problem with it. It is safe and solves the patient’s problem.” To those voices, I point out that if adenosine was not a big deal, then give it to yourself. There are medications most paramedics have given themselves – D50 into 1000mL of saline when you’re feeling sick, or a neb when you’ve got some lung filth that isn’t clearing up. I drank bicarb once for blisteringly painful heartburn (tastes pretty nasty). But adenosine would not be on the list of those meds, even for the most maniacal medics. Why? Because the short half-life argument isn’t a good one. Before getting into the dangers of adenosine, let’s think on the logic of giving the example patient above a dose. He isn’t sick, else we’d be shocking him. We are talking about stopping his heart for a fluttery feeling in his neck. Think about that – stop a heart, however transiently, to fix the fluttery feeling. To me, this seems like killing a fly with a sledgehammer. All this depends on your transport time and the other specifics of a real life call, of course, but are you really comfortable about painfully stopping a person’s heart for a fluttery feeling? Have you watched a patient get adenosine? It is not pleasant for them. Every medication administration is an exercise in your ability to weigh risks and benefits. In the case of SVT, I am not always convinced we do a good job of understanding the risks of adenosine and weighing the benefits we expect to gain. Adenosine can actually be pretty dangerous in some settings. It can cause bronchospasm to the point of causing fairly severe problems (1), but the biggest problem comes when it is given to atrial fibrillation and atrial flutter. 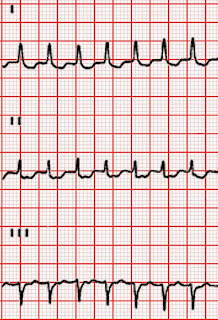 Atrial flutter with 2:1 conduction can often mask the pathognomonic sawtooth pattern and be mistaken for SVT. 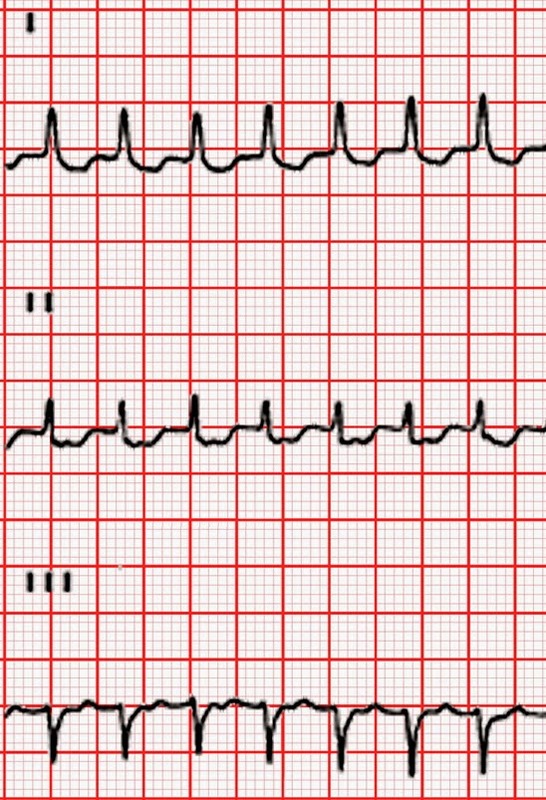 Administration of adenosine can cause the 2:1 flutter to accelerate to 1:1 flutter (2). So I avoid grabbing the adenosine until I see heart rates that are unlikely to be 2:1 atrial flutter – heart rates faster than 170 at least, but I feel even more comfortable at rates faster than 180. Atrial fibrillation is something to be avoided, as well. First, adenosine plum doesn’t work to convert AFib. It works by slowing or blocking conduction through the AV node, but doesn’t work on bypass tracts like a Bundle of Kent. So adenosine can be especially dangerous if they have a bypass tract (which can be concealed). You may not see the nice textbook-style delta wave on a 12-lead. Adenosine can accelerate the rate to greater than 250 beats per minute, with subsequent hemodynamic instability (2-5). Ventricular fibrillation can even occur (6,7). So for me, any irregularity rules out adenosine. Be careful – the difference between 188 and 214 beats per minute is the difference between 7 and 8 millimeters on the paper. Irregularity can be subtle at faster heart rates! I understand that the risk of adverse events is rare after adenosine administration. But it does exist. Are you sure you want to take the one in a thousand roll of the dice for otherwise stable palpitations? I would like to preach the strengths of what other websites have called benign neglect. Watching and monitoring a patient is often the right answer. Not every problem needs to be solved in the 15 minutes that I am with a patient. So, to me, adenosine is useful in a narrow subset of patients who don’t yet have an altered level of arousal, but who need to have the SVT terminated – hypotensive, ischemic chest pain, that kind of thing. All the other SVT patients with the fluttery feeling get watched (in my system with short transport times). And I avoid adenosine if there is any irregularity to the rhythm. As with all medications, the risk needs to be outweighed by the benefits. If the only expected benefit is to get rid of palpitations, then there needs to be essentially no associated risk. With adenosine, there is some risk. Consider practicing better vagal maneuver skills. I have seen paramedics go through the motions to cross vagal off their list before moving on to adenosine. Instead, actually work with patients to get a vagal maneuver that works. Also consider a fluid challenge. 200 or 300 milliliters of saline often terminates SVTs. I think you may be surprised at what skilled vagal instructions, fluids, and patience converts. If you’re interested in a detailed description of how adenosine works, check here, here, and here. Have a good one, and stay safe. *As an aside, does anyone else find it weird that ACLS doesn’t call for pre-shock sedation or analgesia? 1. Burkhart KK. Respiratory failure following adenosine administration. Am J Emerg Med. 1993;11(3):249–250. 2. Mallet ML. Proarrhythmic effects of adenosine: A review of the literature. Emerg Med J. 2004;21(4): 408–410. 3. Exner DV, Muzyka T, & Gillis AM. Proarrhythmia in patients with the Wolff-Parkinson-White syndrome after standard doses of intravenous adenosine. Ann Int Med. 1995;122(5):351–352. 4. Haynes BE. Two deaths after prehospital use of adenosine. J Emerg Med. 2001;21(2):151–154. 5. Nagappan R, Arora S, Winter C. Potential dangers of the Valsalva maneuver and adenosine in paroxysmal supraventricular tachycardia--beware preexcitation. Crit Care Resusc, 2002 Jun;4(2):107-11. 6. Shah CP, Gupta AK, Thakur RK, et al. Adenosine-induced ventricular fibrillation. Indian Heart Journal, 2001;53(2):208–210. Kind of a coincidence - I just posted an article describing the relative safety of using adenosine in patients with a history of WPW. Ironic! Dr Walsh, I am all chuffed up having one of my favorite blog authors compliment my blog. Thanks a lot. I'm a recent recipient of adenosine. And an ACLS certified RT. I've had small SVT episodes for 15 years. A few seconds to minutes of what feels like a small bird flapping around in my chest, followed by a cough, then done. 3 yrs ago an episode lasted 10 minutes needed lots of coughing and bearing down, finally stopped. 2 wks ago, brutal attack. In Switzerland, on vacation. After 30 min, HR 180, dizzy, weak, lightheaded,pressure in chest &throat, unable to stand alone, we found an ER. Knew adenosine was coming.All vagal maneuvers failed. It felt like an intense squeezing starting in my neck and traveling down my body. In a few seconds it washed away. 12mg went all the way down my body. 6, about halfway. I felt SO much better after converting to NSR. So, for me, it was worth the several seconds of discomfort to stop my SVT. I think you underestimate the range of discomfort of SVT episodes. Yes, most are insignificant and don't interfere with ones life. But the one I just had was awful, and now I have the ever present thought that this can again at any time. Considering ablation, as my normal BP is too low to take a beta blocker.